Large White Pine + Being struck by lightning + Leaning over a barn = Disaster! 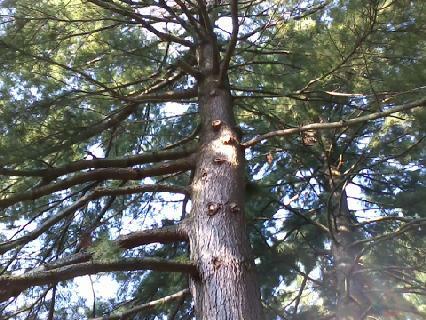 Every tree job I do always seems to be an adventure. For any of you that have had the joy of cutting White pine, it is quite fun. There is never a gentle creaking sound as a branch gradually bends as you cut it, it just holds steady till it reaches its breaking point and then POW like a shotgun it breaks in two and falls. Which is always a blast 40 feet up in a bucket!! One last look over to eye up the obstacles for felling. About a 15 foot clear landing where I am taking the picture from. An apple tree on my right and a small ornamental tree up and to the left. And a deep breath of relief. other than a few apples knocked to the ground, she went right were she was supposed to!! And for a bonus, as long as I can get these on the saw mill and with any luck they will fit, I will be able to make enough 12 foot beams for a beautiful farm stand for next summer!! Posted on August 22, 2013 by Anna Kirkwood.